James Norcliffe has written that '2000 was for me a hugely productive and wonderfully enjoyable year and I remain grateful for the opportunity'. In his Burns year, Norcliffe wrote the poems that formed his fifth collection, Along Blueskin Road (2005), wrote some poems that formed his sixth, Villon in Millerton (2007), wrote The Assassin of Gleam (2006), which won the Sir Julius Vogel Award for the best science fiction/fantasy novel, and started 'Yewfire', a fantasy novel, and the first draft of 'Nodding Donkeys', a novel set in Borneo. Here are two of his works on display. 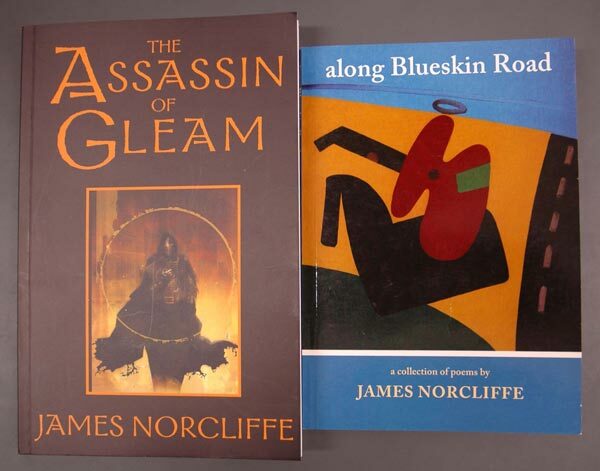 James Norcliffe, Along Blueskin Road. Christchurch: Canterbury University Press, 2005. Private Collection; ___, The Assassin of Gleam. Christchurch: Hazard Press, 2006. Private Collection.